We are one of the main supplier of Asics Running Shoes. By keeping track with the modern trends, we are bringing forward a wide series of Mens Asics Running Shoes to our valued patrons. Perfect for the everyday player who wants a competitive edge, the new gel-court speed™ tennis shoe aces comfort, stability and support. Full-length gel cushioning teams up with the advanced trusstic system structure to keep you ready for whatever your next move may be. In addition to its appealing style, the seamless mesh upper keeps your feet cool and dry throughout the entire match. 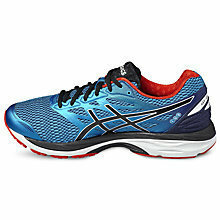 We are engaged in offering Asics Running Shoes.